There are dozens of articles hyping government purchases of ammunition over the last nine months. After spending weeks researching this topic, this is a collection of commonly held myths that are based more on panic than fact. MYTH: DHS purchased 750 million rounds of several different types of ammunition in August 2012. FACT: The DHS contract never stated 750 million rounds at any time. It is a five year contract with a maximum purchase of 70 million rounds over the life of the contract. Military Times recently addressed this issue as well. MYTH: DHS purchased an unprecedented 450 million rounds of .40 S&W 180gr hollow point bullets in 2012. FACT: This is a standard five year contract that follows a historical purchasing pattern of DHS. Furthermore, it is not an “unprecedented” purchase by DHS. In fact, it is not even a purchase by DHS but by Immigrations and Customs Enforcement (ICE). Starting in 2003, orders of 50 million and 225 million .40 S&W hollow point ammunition totaling 275 million rounds were purchased. After the expiration of the five year contracts in 2008, ICE purchased an additional 575 million rounds of .40 S&W hollow point ammunition with two separate orders (200 million and 375 million). Now, with the expiration of the 2008 contract, ICE has ordered a maximum of 450 million rounds over the next five years. MYTH: DHS recently purchased 21.6 million rounds for their New Mexico Training Center. FACT: The math doesn’t add up. The FedBid listing is actually for 240,000 rounds. MYTH: The estimated 1.6 billion rounds purchased by DHS would sustain the military for over 20 years. FACT: This myth was even reported by Forbes. While this number is comparable to rounds expended at the height of combat in Iraq, the actual ammunition produced for the military annually is, quite ironically, 1.6 billion rounds. Many conspiracy theorists are not accounting for ammunition expended in training. A well-trained police officer will expend a minimum of 2,000 to 5,000 rounds per year, yet may never fire their weapon in defense. There is a significant disparity between rounds fired for training and those fired in a real world scenario. Similarly, DHS agencies train quarterly, with an expectation of using 1,000 rounds per year per firearm for training and qualifications, while an officer may never fire a single round from their firearm on duty. MYTH: DHS purchasing a wide variety of calibers for training means they are training for war with the American people and to utilize common civilian weapons. FACT: DHS has purchased large quantities of ammunition in a variety of calibers once in 2006, 2008, 2009, 2010, 2011, and 2012. The orders included .22 LR, .44 Magnum, 7.62 x 39mm, .45 LC, and a variety of other popular calibers to be used at several Federal Law Enforcement Training Centers across the country by a wide variety of agencies and entities. MYTH: The government is purchasing 1.6 billion rounds to cause shortages on the civilian market. FACT: Actually, the total number of rounds purchased from late 2011 to 2013 is less than 800 million rounds over five years. Conspiracy theorists have overestimated the round counts by at least 800 million rounds. Current orders mirror prior purchases totaling 766 million rounds from 2006-08 and 454 million in 2003, all over five year periods. The total for government purchase orders on a per year delivery basis calculates out to less than 160 million rounds purchased this year. For perspective, the National Shooting Sports Foundation and NRA estimate a minimum of 10 billion rounds of ammunition is produced domestically annually. This translates to the Department of Homeland Security affecting 1.6% of the market share of ammunition domestically produced. A recent response by the Department of Homeland Security to Senator Tom Coburn reflects even lower numbers. In 2013, DHS expects to purchase $37 million of ammunition. This total is in between the last two years of purchases and puts their total round count closer to 105 million rounds. In reality, DHS has closer to 1.05% of the total market share for this year and far less than the last three years. MYTH: Then why can’t I find ammo? What’s causing the shortage? FACT: We’re causing the shortage. As an employee for a major firearms retailer, I can testify we receive shipments of the three highest demand calibers (9mm, .22 LR, and .223 Rem/5.56 NATO) at least 3-5 times weekly and in quantities far exceeding our normal shipments. 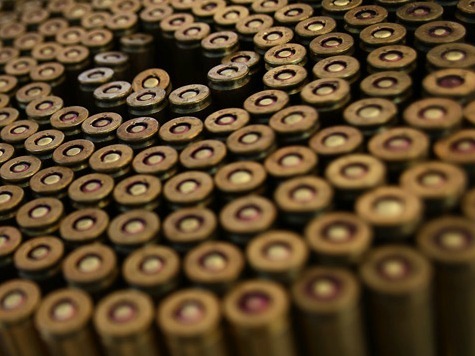 We see as many as 1,000 boxes of ammunition disappear in as little as four hours. People are responding to the unknown with fear and hoarding of ammunition. Manufacturers are replenishing the shelves, but the civilian market is buying it too fast due to warranted (and unwarranted) concerns. Don’t believe me? Ask your dealers, or wait at a local Wal-Mart. MYTH: If the government isn’t stockpiling, why would they purchase so much at once? To save money? FACT: The government purchases large quantities of ammunition in ID/IQ (Indefinite Delivery/Indefinite Quantity) orders, only guaranteeing to purchase as little as 1,000 or 100,000 rounds per year. The large orders lock in rates in the event ammunition prices increase as they have in recent years. For instance, a large order means DHS can purchase ammunition in 2012 at 2008 prices from a contract secured in 2007. However, it can translate to manufacturers passing the cost onto consumers. But remember, these orders account for less than 1.6% of the annual market share for just domestically produced ammunition–not including foreign imports. For now, price increases are demand related.